Base class for SegmentationRegion object. 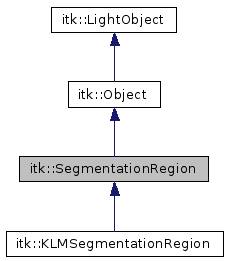 itkSegmentationRegion is the base class for the SegmentationRegion objects. It provides the basic function definitons that are inherent to a SegmentationRegion objects. A region object is defined by the label it owns. We use integer labels to represent a region. This object stores the region label. The user can get the area and a label associated with the region through access functions provided publicly. This class provides an interface method called ApplySegmentationRegion is defined as virtual to enable future extension of the region object. This object can be used where region in images needs to be defined. Child classes can be derived from this class for tailoring them towards specific algorithmic needs. Definition at line 45 of file itkSegmentationRegion.h. Definition at line 52 of file itkSegmentationRegion.h. Definition at line 51 of file itkSegmentationRegion.h. Type definition for a segmentation region label. Definition at line 58 of file itkSegmentationRegion.h. Definition at line 49 of file itkSegmentationRegion.h. Definition at line 50 of file itkSegmentationRegion.h. Define a virtual SegmentationRegion function that is meant to be used in derived classes if some operation needs to be performed on a region object. Definition at line 66 of file itkSegmentationRegion.h. Set/Get the area of the region. Set/Get the region with parameter values defining the region.